The QuietCall® digital coaster pager is stackable and a great space-saving solution. The charger fully charges up to 15 pagers in 2 hours. The pagers feature user-replaceable batteries for maximum uptime saving you time and money. 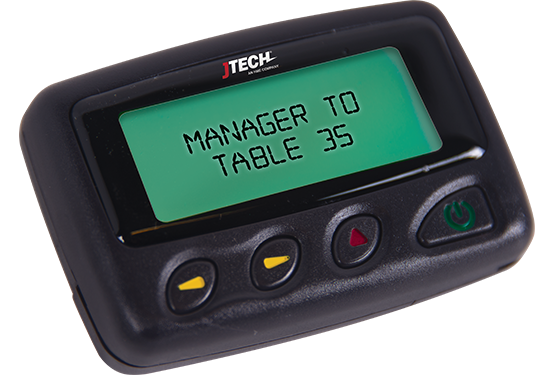 Use QuietCall® pagers to notify restaurant guests or patients with a flash or vibration when it's time to be seated or seen. In a noisy restaurant setting, a light-up coaster pager is easy for guests to notice. For healthcare, patients are more assured with a silent page as they feel they have more discretion over their doctor wait. For any industry, put your own label on this pager to promote your practice and services. Our digital coaster pager is one of our most popular-selling pagers for medical facilities, warehouses, retail and restaurants. The QuietCall® Coaster Pager is extremely flexible and integrates with other paging systems. Up to 2 miles of range with unique ID to prevent signal interference. Built with high-quality materials for maximum durability and industry-leading performance. Out-of-Range and Search feature ensures patient and family contact. Integrates with many industry-standard software such as EMR (Electronic Medical Records) integration capability.